June 19, 2014, 5:21 PM · ORLANDO — Author Tom Stoppard built his popular reputation with Rosencrantz and Guildenstern Are Dead, a retelling of Shakespeare's Hamlet from the perspective of two minor characters in that enduring tragedy. That can be a clever device, allowing us to see a familiar story from a fresh angle. But what if that angle were not of a minor character from the famous story, but that of the reader? 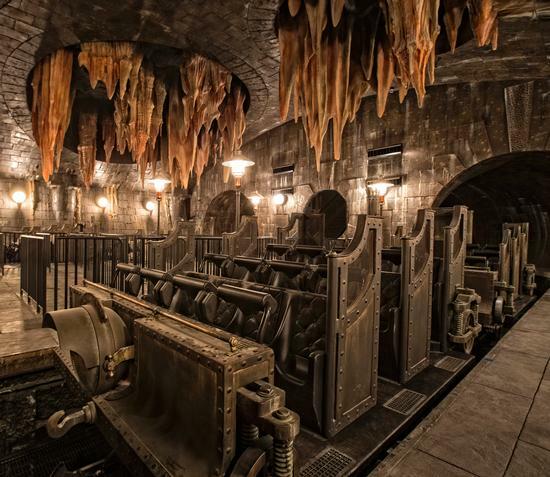 That's the set-up for Harry Potter and the Escape from Gringotts, a new thrill ride in Universal Studios Florida's Wizarding World of Harry Potter - Diagon Alley. Yet Universal Creative's crafted much more than a thrill ride here — it's retold a classic tale from your perspective. 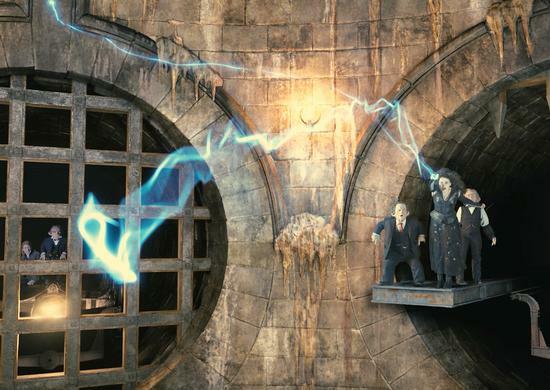 The familiar story is from Harry Potter and the Deathly Hallows, where Harry, Ron, and Hermione con their way into Gringotts Bank to steal (and, ultimately, destroy) the Horcrux in Bellatrix Lestrange's vault that holds one-eighth of evil Lord Voldemort's soul. By a coincidence unknown until the opening of Universal Studios Florida's new land, that also happens to be the same day that we, fellow Diagon Alley visitors, have chosen to visit Gringotts to open our own accounts. Like in Stoppard's creation, we have a minor character on board here, as we've got an appointment with Ron's little-seen older brother Bill Weasley to tour the bank's underground vaults. As Bill Weasley says in his sales pitch to us, "it's the safest place on Earth!" Our visit begins innocuously enough, with a stroll through Gringotts' opulent Great Hall, where animatronic goblins sit, perched above eye level, hard at work while we gawk at the stunning detail in the faces and movements. From the Great Hall, we proceed down to the bank's offices, where attendants take our photos for our bank record (and, yes, for the end-of-ride souvenir sale), before we head down the hall to Bill's office. From Weasley's office, it's into one of a pair of lifts for the trip 10 miles down into the Gringotts vaults. It's an appropriately hammy trip, with shaking floors and video effects creating the illusion of a reckless plummet. When the doors open, we walk up a spiral staircase to the loading platform, where we board the the twin, 12-person roller coaster trains for our tour. Then, of course, it all goes terribly wrong. Our heroes have been detected, and Gringotts' security defenses are coming to life. Bellatrix herself appears as we're about to launch into the ride, to curse us as potential accomplices to the theft of her vault. Fortunately, our new friend Bill is near, to save us from hurtling into oblivion with an "arresto momentum." Escape from Gringotts plays on a creative ride system that incorporates a roller coaster track with embedded motion bases in several spots (*note: updated with a more accurate description of the ride system), allowing a unique range of motion that leads you to forget about the ride itself and focus instead on your role in the attraction's grand story. 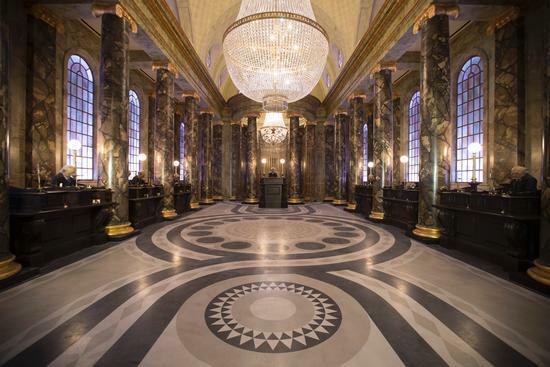 The action takes place on 3D screens, set amid richly detailed practical sets of the Gringotts caverns. Our rescue lasts but a moment before Gringotts trolls attack, mistaking us for the intruders. We're thrown through The Thief's Downfall, before another troll attack sends us plunging hundreds of feet toward our certain doom upon the rocky rapids that churn upon the floor of the caverns. We're not really falling, though. It's just the combination of the motion-base vehicle and the 3D animation at work, as on Universal's Amazing Adventures of Spider-Man and Transformers: The Ride 3D. But the setting and 3D technology work even more convincingly here, making the moment of our rescue (again!) all the more thrilling. Bill sends us off to a vault for safety, and it's at that moment that Escape from Gringotts takes us to another level of emotional engagement. The hissing of the snake Nagini warns us of the arrival of Bellatrix and He-Who-Must-Not-Be-Named, Lord Voldemort. Helena Bonham Carter and Ralph Fiennes work among the "A" team of Harry Potter actors, two superb professionals who have crafted utterly captivating villains, and Universal has brought them on board to recreate their roles for this ride. To see these two at work in these characters again would by itself be a joy. But larger than life and in sharp three-dimensional projection? I could watch them here all day. If they weren't trying to kill us, of course. Bellatrix curses us away, though we soon discover that the pair are only toying with us. As we careen into the next cavern, they arrive again, riding plumes of black smoke, to torture us to a fiery death. We are spared only when Harry, Ron and Hermoine — atop their recently-hijacked dragon — find us, directing the dragon to fend off Voldemort's fireball. Hermoine throws us a chain, and the dragon hauls us up out of the cavern to safety. It's a thrilling finale launch through the wall of the scene into our finale, where Bill greets us with congratulations and a final, now ironic, repeat of his sale pitch to open an account: "It's the safest place on Earth!" We rode Escape from Gringotts after the celebrity red carpet event on Wednesday night. (Brian stepped into the same seat Matthew Lewis [Neville Longbottom] was stepping out of at the load/unload platform.) On our first ride, the ride system stalled during the first troll attack, leading us to creep through the next two scenes in a slow-motion safety mode, before picking up the video during the initial Voldemort attack. Unfortunately, the audio failed to synch properly, keeping us from following the rest of the story. When we returned to the station, the Universal ride attendants kindly allowed us to remain in our seats for a second attempt, during which the ride functioned flawlessly. Unfortunately for many other invitees, Escape from Gringotts didn't accommodate them with complete shows, and most others we spoke with this week failed to get through without interruption, or to get on the ride at all. Universal has declared July 8 to be the official public opening for Diagon Alley, allowing the park nearly three more weeks to work out all the kinks and get the ride functioning with more reliability. Coming later tonight: Our overview video of Diagon Alley, including scenes from inside the Gringotts queue. June 19, 2014 at 6:02 PM · From my perspective the so-called "glitches" are an affirmation that Universal Creative is fearless. Never cutting it cheap and always pushing the envelope. In the weeks ahead the technical challenges will be addressed and Universal Creative will maintain its standing as the gold standard in themed entertainment. June 19, 2014 at 7:12 PM · As long as the dragons are not eating the tourists, I'm okay with a few delays. June 19, 2014 at 8:12 PM · I'm really looking forward to this ride. I just hope they don't dumb-down the 10-mile plummet simulation like they did at Forbidden Journey where they removed the simulated fast rise out of the castle just because weak stomach and vertigo prone guests complained. June 19, 2014 at 8:16 PM · Excellent analysis & comment by TH. June 20, 2014 at 12:17 AM · Robert, you write a few times "propelled". Is that a speed up of the ride or is it suggested by screens? And most important has it curved banks? How much is coaster and how much not? Was any of this noticeable or are you unable to tell? The ride sure sounds amazing (as does the queue that is an attraction in itself). Can't wait to try it out and thank you for all your great reviews. June 20, 2014 at 6:56 AM · Is the motion-base movement as intense as Indy? June 20, 2014 at 7:27 AM · No, Daniel. The ride isn't as physically intense as FJ, Indy, Transformers, etc. The motion base spins and jiggles the cars, and not particularly intensely. June 20, 2014 at 8:02 AM · I'm convinced they lowered the height requirement so that Warwick Davis could ride it. June 20, 2014 at 8:50 AM · Robert is the Escape from Gringotts ride able to accommodate people of all sizes. I know when we rode FJ it was a tight fit for me and a lot of the other guest in line with me. I am sure when we go back I will not be able to ride FJ this time because of the extra pounds I have put on. I guess a diet is in my near future. Wish Universal would keep this in mind when building these new attractions because larger people like to have fun too. June 20, 2014 at 8:56 AM · Are there queue switchbacks in the Great Hall? I would hate it if this hall is marred with guests standing around. The photos shows it as empty. Where do guests enter and exit? June 20, 2014 at 9:24 AM · Anon, it is empty. You enter from perspective of the shot above and exit behind the goblin on the far end. As for riders of all sizes, the best comparison is with Mummy. If you fit in those seats, you'll likely fit in these. June 20, 2014 at 9:47 AM · Now I'm confused. Your picture indicates that people will just stand around in the Great Hall, but other pictures from a while back showed some small metal plates that suggested that there would indeed be switchbacks. I can't imagine them not using the latter with the expected crowds. June 20, 2014 at 1:04 PM · Robert, does the ride have AAs and physical sets? Or is it all 3D? June 22, 2014 at 2:25 PM · Oh my goodness!!!! Can't wait to ride Gringotts! 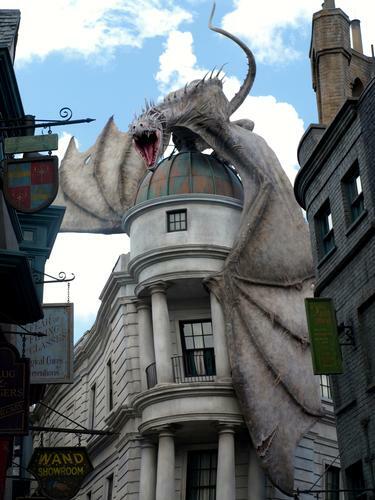 That is what I am most excited about in Diagon Alley! Love all the detail and authenticity that those wizards put into all of Diagon Alley!